This must be some bad economic times that we are going through. 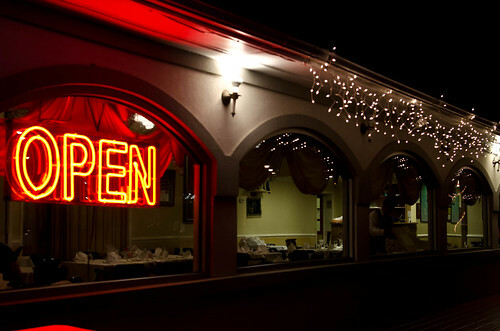 Uncertainty seems to hover over the housing market, the stock market, the job market, a looming sequestration, and undoubtedly the restaurant business. More than a handful of restaurants that I have reviewed have folded up since I started a year ago. To make matters worse, both Vietnamese restaurants on my blog have shut their doors, one after nearly 15 years of business, and the other just a mere 8 months. 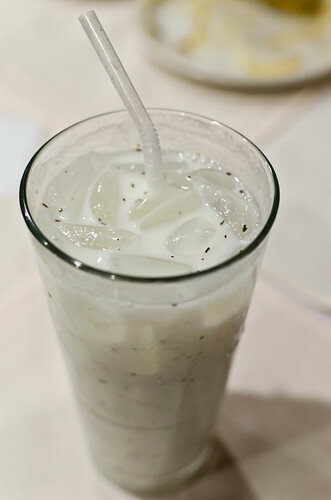 As you may have read about my elusive search for a good Vietnamese eatery near me and in DC, this series of events was quite a blow. With such daunting news in mind, I approached my trusty Vietnamese barber and asked her for a reliable recommendation. She pointed me to Eden Center, in the Seven Corners neighborhood of Fairfax, VA, where there is a confluence of Vietnamese business that populate that rather expansive plaza. This was one place that I used to visit quite often to savor some good cooking when the Four Sisters Restaurant ran their business there before moving further out to the boondocks. After their move, there was little cause to visit that area except when the occasional taste for steamed tofu with ginger syrup propelled me to drive the nearly 30 miles to terra incognito, as it seems that way to me. But with a strong reference in mind, I coraled my dinner group on the eve of the Lunar New Year, or Tết in Vietnamese, and paid a visit to Huong Viet , a small eatery that has survived all these years since my visit there nearly 20 years ago. Walking into the establishment, the decor and the set up are not as plush or creative as most modern restaurants, and the regularly spaced long and short tables do bring to mind a nice clean cafeteria. After a short wait outside in the cold, we were shown to our long table that accommodated my party of five. Any feeling of doubt or hesitancy was immediately erased by a sense of assurance brought about by the busyness of the restaurant and the number of Vietnamese-speaking customers in the place. With that thought in mind, I plunged into the menu and quickly ordered some common appetizers. 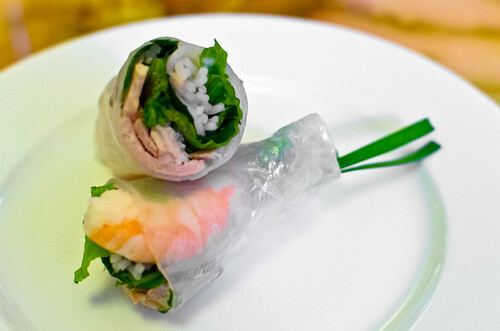 The Summer Rolls came with soft rice crepe paper wrapped around a filling of perfectly cooked moist rice vermicelli noodles, fresh sweet shrimp, mild roast pork, crisp lettuce, fragrant mint leaves, and finished with a long strand of pungent Asian chive. But what tied all these disparate elements together was the dipping sauce. This restaurant’s version had only a bare hint of hoisin unlike other versions that overwhelms the palate with its flavor. Mixed in it was a peanut sauce that made it rich and nutty, and its unique balance pointed towards it being house-made rather than store-bought. This was a good fresh bite. 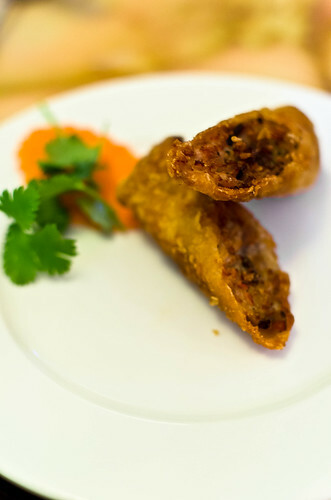 We also ordered the counterpart to the above – Fried Spring Roll or CHẢ GIÒ. When it arrived at the table, I noticed a few variations from the norms commonly found in other places. 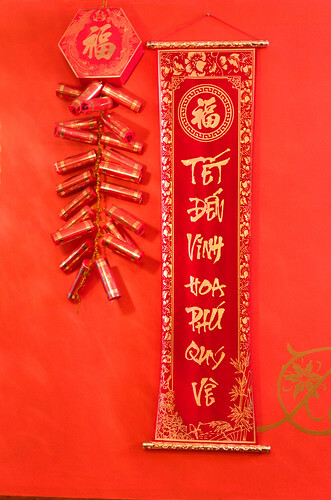 First, the large bubbles on the fried skin indicated that it was made in a traditional fashion with Vietnamese rice crepe paper and not with Chinese spring roll sheets that are commonly used these days. The second was that it was cut into two before it was deep-fried, which intrigued me even further. Sheer hunger or delectable food can produce a certain suspension of analysis of thought as I honestly don’t recall much from this dish. All I remember was that the stuffing tasted very moist and savory encased by a crispy shell, and these bites disappeared quickly among my friends who snatched them up while piping hot. The side sweet and salty fish sauce was adequate but not as memorable as the expensive elixir served in the defunct Green Papaya restaurant. However, this dish was worth a moment of relapse during dinner. Another common appetizer found in this Southeast Asian cuisine is Young Lotus Root Salad. Strands of cooked lotus roots have been mixed with pieces of pork and whole shrimp, lightly seasoned by the ubiquitous sweet and salty fish sauce. Wow, I could barely get a bite of this because it was ferociously attacked by my companions, and deservedly so. The pieces of lotus were perfectly cooked while maintaining its characteristic light crunch along with its savoriness developed from being marinated. The sweet shrimp and moist pork provided the unctuous notes to the mild root, while the crushed peanuts and fried shallot rings added the nuttiness and dark flavors to the clean mild tasting salad. The rounds of addictive shrimp crackers provided some textural interest as well as serving as the perfect scoopers for this melange. This was definitely a hit for all of us and we should have ordered another serving of it. For our main courses, we ordered a quartet of dishes. 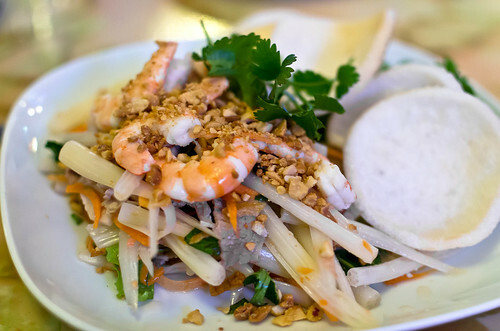 The first was a classic Vietnamese dish found in any reputable restaurant – Bánh Xèo. 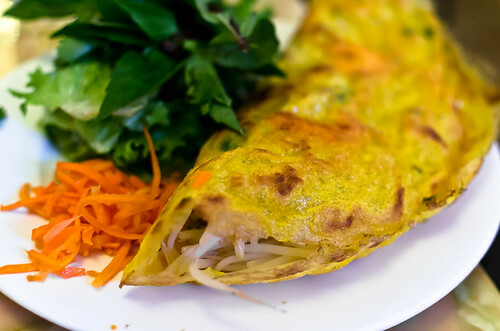 This stuffed crepe dish literally means “sizzling cake” consisting of a rice flour crepe stuffed with pieces of pork, cooked shrimp and a heaping of cooked bean sprouts. The crepe had a hint of coconut milk and it was quite crispy, however, not rich or crispy enough for my taste, compared to the fabulous version in The Green Papaya. Like most versions, the crepe is underseasoned for it is the sweet and salty fish sauce that imparts the necessary seasoning to this very mild dish. Once my companions figured how to attack the dish, they were enjoying every bite of it. But I could not help but reminiscence the rich delectable version of the aforementioned closed restaurant. While waiting outside, an acquaintance of one of my dining companions recommended that we order Shakey Beef. The name was odd enough for me and I had never come across a dish with such name. 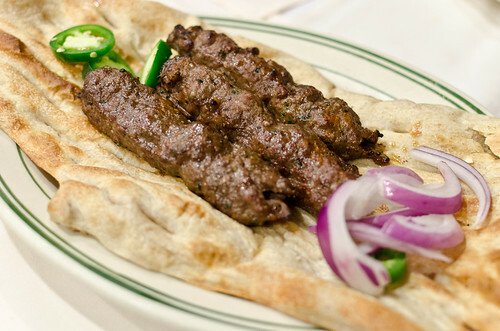 The order arrived with pieces of cubed beef along with some onion and green pepper squares, plain and assuming. The first bite revealed a personality beyond its unassuming looks. 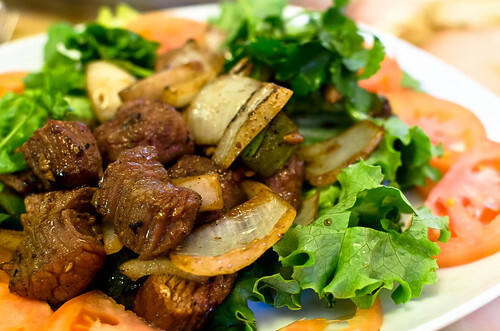 The beef was tossed and seared on high heat in the wok, judging by pieces of caramelized bits, while maintaining a tender medium-rare inside. Surprisingly, every bite tasted well seasoned and very savory from what tastes like soy sauce, bits of garlic, and a hint of sugar that brought the flavors to another level. This was a truly successful dish for all of the diners and I enjoyed every beefy bite. To bring some balance to the meat dishes, we ordered Shrimp with Vegetables. 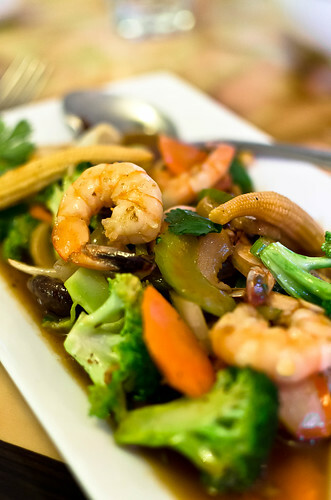 Pieces of celery, broccoli, carrots, mushrooms, and baby corn are paired with pieces of large shrimp in this dish. The sweet tender shrimp made the perfect foil to the pieces of sweet al dente pieces of vegetables, while the mushroom adds some earthiness and the baby corn some young sweetness. What brought all the elements together was the rather rich sauce packed with garlic pieces flavored with oyster sauce and thickened with corn starch. Although it was a rather light dish, the savory sauce made it seem richer, and it was worth ordering this vegetable seafood dish. Another hit among my dining group. No visit to taste this Southeast Asian cuisine should have a lemongrass dish amiss from the dining table, and we honed on Caramelized Lemongrass Chicken. The plate arrived with chucks of chicken thigh cooked with large pieces of sweet yellow onions, swimming in a shallow pool of brown sauce. What truly made this two-ingredient dish delectable and successful was the sauce that was packed with the citrusy lemongrass paired with the seafood salty fish sauce with a tinge of sweetness from the caramel that rounded off the flavors. 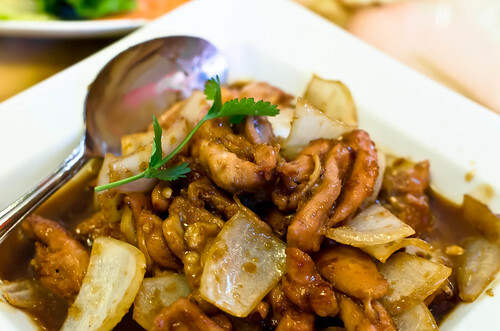 The pieces of chicken thigh was not the mild breast version so as to stand up to the punchy sauce while adding the necessary body along with the sweet and pungent onion. Even when the morsels were gone, I was lapping up every drop of sauce with bits of rice as I could not get enough of the sauce that transported me to Indochina. Another must order here for sure! Despite feeling content with the above dishes, I was curious about the unique Vietnamese sweet servings. There was not much in terms of solid desserts with the exception of Caramel Flan but the menus listed a list of sweet drinks with bits of “stuff” that are commonly eaten by the locals. My glass came with a concoction of whole red beans, sweet corn, crushed peanuts, and bits of green agar-agar jelly. The sweetening agent was a syrup consisting of a mixture of brown sugar and rich coconut milk. 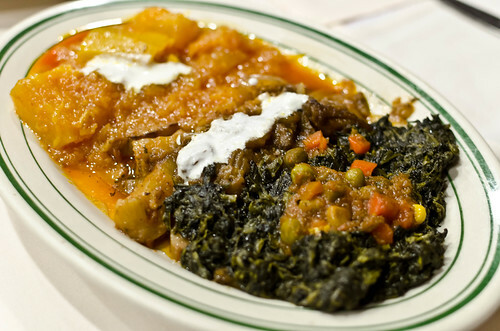 Upon mixing the various elements, things did not look very appetizing at first, but with the first mouthful, it was a revelation of flavors and textures. Every element spoke for itself: nuttiness from the peanuts, sweetness from the corn, starchiness from the red beans, molasses sweetness from the brown sugar, and vegetal creaminess from the coconut milk. 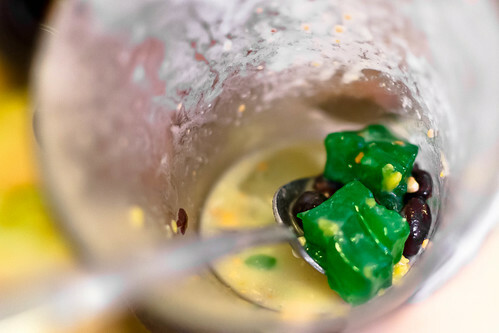 The green jelly did not add any flavor at all but a jellybean-like texture consistency to the bite, which a couple of my friends found a bit disconcerting – LOL. 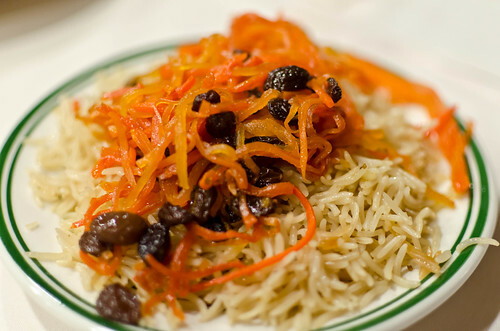 Before I knew it, most of my dining companions were partaking in this sweet dish, and we finished it con mucho gusto. 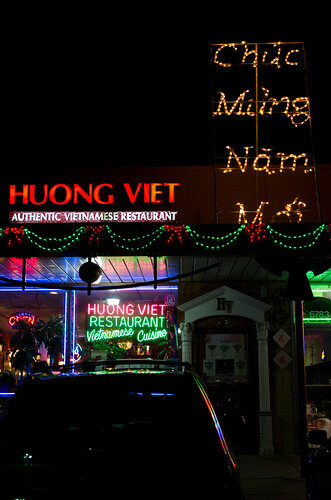 Coming back to Huong Viet for me was like the return of the prodigal son. When in doubt, do what the Romans do, or as in this case, what the Vietnamese do. 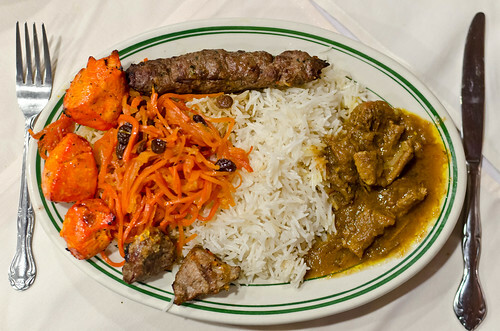 Thanks to my barber’s infallible suggestion, I’m glad to have made the long trek to Eden Center to taste what has always been there all these years – proper delectable Vietnamese dishes that wowed my dining group even days after our visit. Never mind the inattentive service at times and the bare ambience. 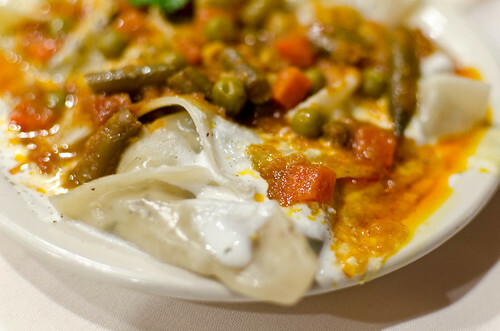 But what makes up for the shortcomings is the main reason to haul oneself there – the impressive dishes. Note to diner – they only accept cash but we walked out of there with barely with a dent made since it was around $20/person. With such good cooking and low prices, I would easily do the 30-mile drive. Note: The Crystal City/Alexandria branch has closed. Warning: The following blog contains NO photos due to the lack of planning, and it was an impromptu visit to this establishment. Furthermore, photos from all-you-can-eat buffets contain too much for the eye to digest and maybe hazardous to one’s health. After enduring the ordeal of getting my blood drawn for a blood test at my doctor’s (yes, poor me, even though it was just a small prick), I decided to “reward” myself with a stop at an Asian bistro buffet not too far from his office. Customarily, I would refrain from visiting all-you-can-eat’s because there is always the temptation of over-indulging and over-eating – at my age, this is not a wise move especially given the fact that I’m planning to take my clothes off in a couple of weeks in public; at the beach, I must add. But with a phone app offer that was running out soon, I decided to visit this Korean-Japanese eatery. Hee Been Asian Bistro sits above the Harris Teeter grocery store in a rather dead modern building complex (most likely a casualty of the depressed economy), located just off the busy Route 1 in the business-filled area of Crystal City, VA. Finding it was quite easy once you notice Harris Teeter which is temporarily closed due to a sewage back-up in the supermarket (oh crap!). Parking in the basement is free, which makes visits during the day time accessible and convenient (Crystal City has the same parking challenges as DC). I paid it two visits on one day for both lunch and dinner (the punishment of gluttony I had to endure for this task!). Walking into the establishment, you immediately notice the far wall covered end to end with several buffet sections displaying the various offerings. It is rather overwhelming by such a large display, but hunger and growing anticipation quickly dissipate this sense of confusion. The only remedy in such situation is to attack without hesitation, or “attaca” as composers would print in their music. 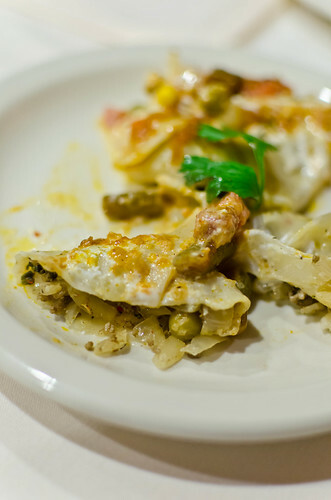 On one end, the buffet section contains various forms of salads, from the simple Potato Salad to the more bistro-like Crab Salad on Endive or the Apple and Arugula Salad. I found the salads to be very fresh and tasty without being overdressed. The next station was the Sushi section that contained amazingly at least 22 types during lunch time. I was rather surprised by the freshness of the seafood and by the variety in this section, from Clam Sushi, Tuna Sushi, Octopus Sushi, and Salmon Sushi, to the different rolls that contained the fresh seafood made with velvety ripe avocado. Fortunately, the Sushi Rolls have not be too “perverted” by overzealous sushi chefs with their bizarre creations as these were rather simple and unadulterated, the way I prefer my sushi rolls. Again, freshness and good ingredients made these bites sing in my mouth. Next to the raw fish section, there were the cooked Japanese section with Tempura Vegetables and Teriyaki Chicken. I did not savor from this section as I have had my fair share of them in my lifetime. Next to it were some Korean offerings of Squid with Vegetable Pancakes and Squash Pancakes. I enjoyed the small round circular discs as they were tastier than what I have had in other places. The Seafood Salad next to it was a tasty delight and I was nearly tempted into a second helping. The Korean Noodles with Vegetable, Jap Chae, were very tasty, which I’m sure my BFF would love to stop by for some. The next section consisted of tradition Chinese and Korean fare. You know, the usual Chinese “stuff” like Fried Rice, Fried Noodles, Pot Stickers, etc, grub that I would not touch at all in most places. But I did go for the hot Korean dishes: Spicy Squid stir-fry (how did they keep the squid tender? ), Korean Pickles and seasoned cold cooked vegetables (I can’t get enough of them, no matter where, and the offerings were great), Cold Soba Noodles (rarely found but a great rendition here), and the typical array of Korean marinated meats. The cooks waiting by the grill will take your plate of raw meats, cook them to perfection, and bring them to your table sizzling on an iron caste plate along with slices of sweet onions. The large pieces of lettuce along with the different spicy bean sauces made the rather sweet beef short ribs (Bulgogi), or the spicy pork or chicken, perfect bundles of grilled meat heaven. A couple of Thai dishes (Chicken Green Curry and Basil Chicken) were surprisingly good and filled with the Southeast Asian spicy and herbal notes. If one hasn’t sated him/herself at this point, there is a rather generous dessert section. It consists of cut fresh fruit, pieces of cake, and gello. Although the pieces of fruit were sweet and fresh, what I surprisingly enjoyed were the bite-size pieces of cake that were not too sweet and packed flavor, like the Strawberry Cream Cake and the Mocha Cake. And as a traditional Korean ending, there is the Cinnamon and Ginger Tea that was laced with the mildly burning cinnamon flavor and the zinging ginger essence. To celebrate a friend’s good news of a new job (finally, thank God/Buddha/Universe), we, along with her partner and friend, paid it a visit for dinner. The buffet had the same dishes, in addition to the offerings of Snow Crab Legs (the celebrant was feasting on this like mad), Steamed Shrimp, Sashimi (looked very fresh and tempting), and Sweet Spareribs (which her partner seemed to enjoy) – such luxurious food items must be a result of the higher dinner price. 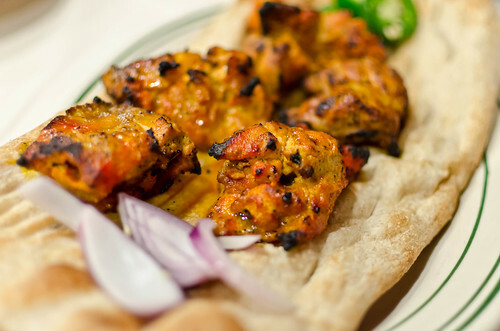 My friends thoroughly enjoyed and were very satisfied by the offerings and the high quality of the food. I chose to order from the menu, Bibim Bap, which consisted of a large plate filled with grilled beef bulgogi, cold cooked squash, cold cooked carrots, fluffy egg pancake, cold cooked broad beansprouts, cooked watercress, and crispy lettuce ribbons, all tied together by a sweet spicy sauce – tasty and satisfying indeed. However, I noticed that due to the lack of customer volume during the night, the hot dishes on the buffet line were starting to look a bit dry, sad and drab from sitting too long on the hot plate. Hee Been Asian Bistro offers an incredibly humongous buffet with dishes made from good fresh ingredients and with expert hands at their two locations. Currently, they are running a special of $9.99 for lunch and $17.99 for dinner for the month of June (thus this hastily written blog). I see myself stopping by this establishment before the month is up, trying my best to refrain from overeating before my Full Monty (not quite, with a bathing suite on, of course) in a few week’s time. Wish me luck!